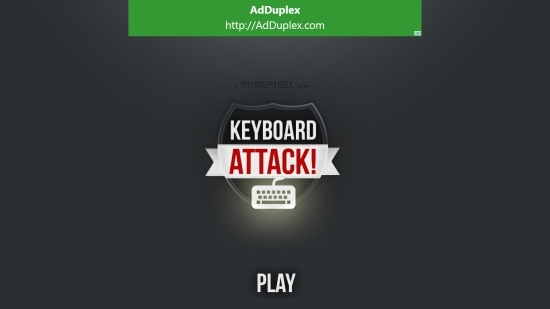 Home Apps Windows 8 Typing Game App Free: Keyboard Attack! 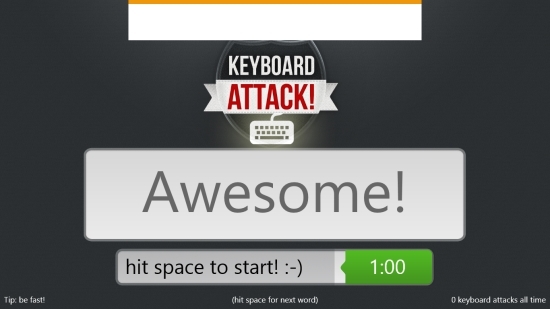 Windows 8 Typing Game App Free: Keyboard Attack! Keyboard Attack! 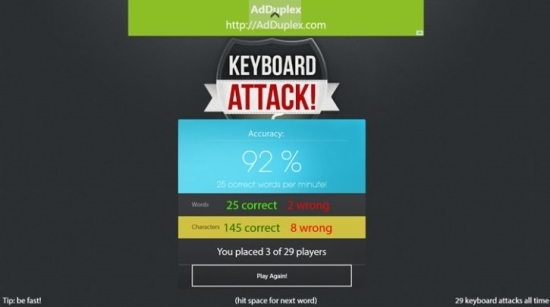 is a free Windows 8 Typing Game app that lets you check your typing speed and accuracy. In this free Windows 8 Typing Game app, you have to type random words displayed on the app’s screen. Your aim should be to type as many words as you can in one minute. This is a simple and quick Typing Game app that helps you find how fast you can type. At the end of the game, it displays scores in terms of correct and wrong words typed, correct and wrong characters typed, and your accuracy percentage. The app also displays your comparative scores with other players. Keyboard Attack! is freely available in Games category of Windows Store. It can be downloaded directly from Windows Store using the link given below at the end. 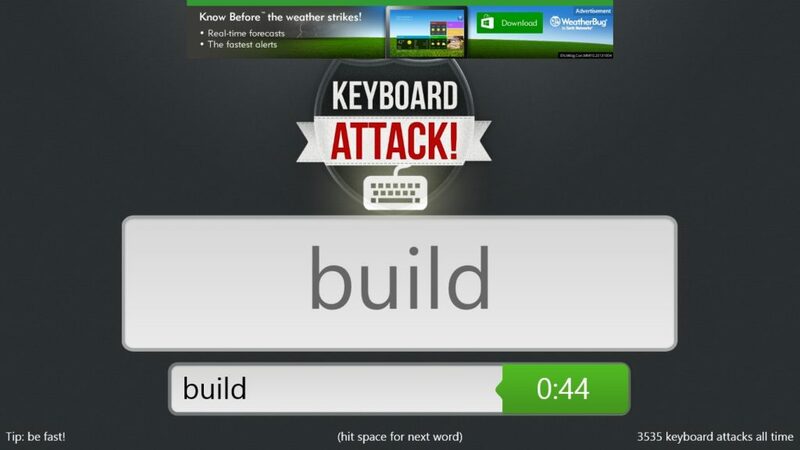 Let’s have a quick look at this free Windows 8 Typing Game app. The Start screen of the app is simple and displays Play option along with app’s logo. The next screen will display an instruction to hit the spacebar to start the game. Along its side, a timer will also be displayed. This timer will control time limit while you play the game. As you hit the spacebar, the next screen will display a random word. Type it in the space provided below this word and hit spacebar to submit it. The next word will appear. Similarly, keep typing random words as they appear. The timer will keep count of time. Try to type as many words as you can. If you type a word correctly and submit it, the screen will blink green for a while before the next word appears, whereas it will blink red if you type and submit a wrong word. As your time gets over, the app will display your scores. You can click on Play Again button to restart the game. Helps in improving Typing Speed. Keyboard Attack! is a nice Typing game app that lets you check your typing skills in a fun way. You can keep playing the game and improve your typing skills. Try it out and share your feedback via comments.